The bitter ferocity of the first stages of the war fueled the animosity and ill will between the two races, killing all hope for peace for years to come. The Caldari were getting stronger by the day as the refugees from Caldari Prime started to settle in, while the Gallenteans were still in a state of confusion following the fall of the fascist regime. The Caldari mounted a series of raids into Federation territory, which the Gallenteans in their slow and cumbersome ships were ill equipped to meet. But the might of the Federation was too much for the Caldari to overcome and their raids, even if successful military wise, had little impact beside draining the morale of the Gallenteans and bolstering their own. After a while the Caldari agenda became clear - they were willing to sign peace if the Federation would return Caldari Prime and acknowledge the newly formed Caldari state. But the Gallenteans couldn’t agree to these demands for two reasons: one, they were loath to admit a sovereign state into their midst; close to their own home planet and were unwilling to uproot the sizeable Gallente population on Caldari Prime, and second, the Gallenteans were not alone in the Federation and if they allowed the Caldari to leave the Intakis and Mannars, both of them starting to flex their economical and political muscles, might be tempted to follow, thus throwing the whole society into turmoil. 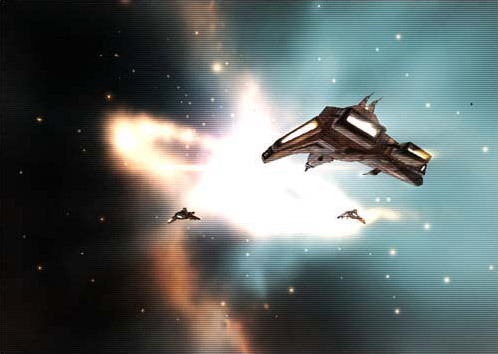 The Gallenteans were forced to regard the Caldari as rebels and renegades and had to try to get them back into the Federation, with good or evil. For a while the Federation could do little else than watch the Caldari play havoc upon the Gallentean fleet and the outermost provinces of the Federation. The Caldari were getting ever bolder and every few months they seemed to have a new and improved version of their nimble solo-fighters, which the Federation had few answers against. To many Gallenteans it seemed inevitable that, unless their demands were met, the Caldari would sooner or later overrun the whole Federation. Everything the Gallenteans tried failed - their attempts for their own solo-fighters were utter failure and stationary defenses such as mines and sentry guns could only go so far in protecting space facilities for long. It seemed like every time the Gallenteans came up with something sleek and speedy and powerful the Caldari would soon respond with something even sleeker and more powerful. Finally, the solution evolved from the stationary defenses of all things. The Gallenteans had employed mines for a long time with so-so results, but with the massive advances in robotics technology taking place at this time the mines were slowly transformed into a far deadlier object. The first drones were little more than mines with proximity detonators and some limited moving capabilities, but soon they had advanced to the level that a single drone almost rivaled a solo-fighter’s capabilities. The fact that drones were many times cheaper to build than fighters and didn’t require a highly trained pilot meant that the days of the solo-fighters were numbered. The drones reversed the tide of the war and now the Caldari were scrambling to come up with a solution against these new weapons. It didn’t take them that long - they simply upgraded their fighters a bit, added some shields and extra weapons and called the new vessels frigates. Some extra crew was also needed at first, but then the Caldari obtained capsule technology from the Jovians some years later and could again reduce the crew to one on most frigates. The climatic battle of the war was fought near the system of Iyen-Oursta. Both sides - the Gallenteans with their drones and Caldari with their new frigates - were confident of victory and thus were willing to throw everything they had into the battle. The result was the second-largest space battle ever fought in the world of New Eden, second only to the Battle of Vak-Atioth fought during the Amarr-Jove War. The Battle of Iyen-Oursta raged for a whole day. During a lapse in the action after almost 15 hour constant fighting the Caldari withdrew in a stately fashion, leaving the battlefield to the Gallenteans. The Gallenteans claimed victory as the side retaining the battlefield, but the Caldari also claimed victory as they had inflicted considerably more losses and causalities on the Gallenteans than they’d received themselves. In any case, the battle gave neither side the decisive victory they’d sought and it was becoming obvious to everyone that such a victory would never be scored. With frigates the Caldari managed the stem the tide of the advancing Federation and before long stalemate again ensued. Slowly, normal life returned for most people, the war became a distant thunderstorm that only occasionally rattled the populace as a whole. Neither side was willing to offer peace for fear of it being taken as a sign of weakness, but the new generation growing up on both sides was willing to sacrifice itself for such an uncertain cause, so the war slowly faded into small-scale border skirmishes and raids. The matter was finally settled when CONCORD, at that point a relatively new entity that had yet to truly establish itself, decided that the war, posing as it did a threat to New Eden’s diplomatic and economic stability, had gone on long enough. Sensing tiredness on both sides after the Iyen-Oursta battle, they used the opportunity to open peace talks between the two obstinate adversaries and were, within six months, able to broker a ceasefire agreement acceptable to both sides. The Federation acknowledged the Caldari state as sovereign and both sides were to retain their original outposts and settlements, except for Caldari Prime, which remained under Federation control.